ESA's Sentinel 2 Satellites provide true color images with a maximum resolution of 10m/pixel. Which allows to observe a whole new level of detail - runways, houses and similar sized features. The swaths captured by the instruments do not completely cover the Arctic during a single day, thus the star like shaped composite image at low zoom levels. Another part of this update adds the full MODIS archive to the Explorer. 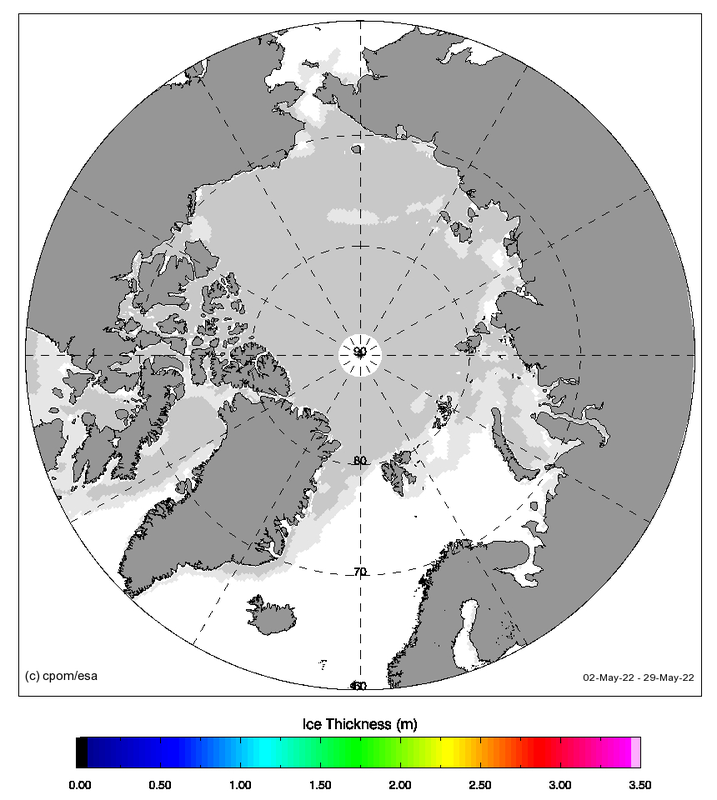 Now Arctic coverage is available starting from the year 2000 - in true or false color and infrared. Since May 11th, 2016 the GFS model is truely 4D and delivers hourly guidance. I've connected the charts module of the weather simulation with this high resolution source of weather data to display these variables: 2m temperature, surface wind speed incl. gusts, precipitation, long and short wave downward radiation flux. Here is an interesting example of strongly raising temperatures in the next days close to Ambarchik, Siberia. Fetching the data from the hourly model takes a little bit longer, up to ten seconds in some cases - thanks for your patience. It was about time to spend this site a face lifting. Mobile Internet access became mainstream, the planet warmed by some more centigrades and many blogs and even portals (in Danish, German, Spanish, Polish, English) appeared reporting the state of the Arctic's cryosphere. So, a few experiments have been dropped and a weather simulation has been added. All high level information and data is now concentrated on this start page. The explorer has changed a little and many visitors will appreciate that the circumpolar map + bathymetry are back. In future there will be little blogging - tweeting is much more fun. However, comprehensive articles are in the pipeline, e.g. why the pre-industrial baseline starts here way before 1850. 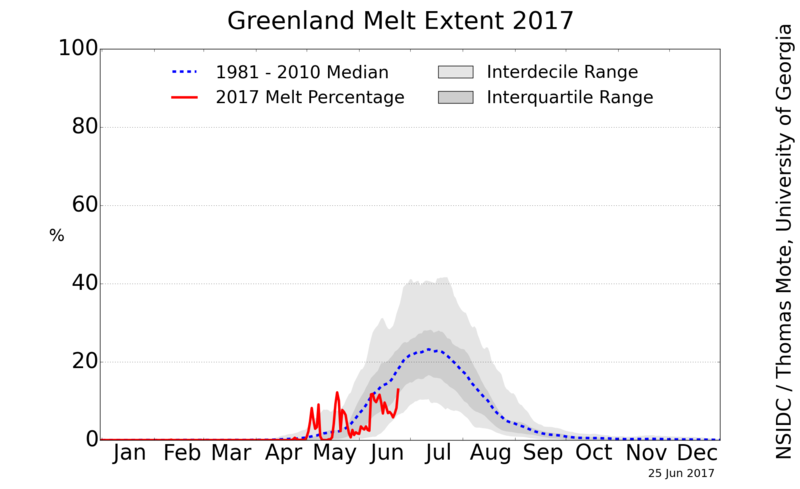 The plan was to update all past blogs before launch, but the Arctic set new priorities in recent weeks. The weather simulation is too useful to wait for any longer. So, old blogs will re-appear as time allows. During the migration is the atom feed disabled. This weather simulation uses a particle system to render forecast and analysis data provided by NOAA/NWS/EMC's Global Forecast System (GFS). Currently active variables are: 10m wind speed, 2m temperatures and sea ice concentration. Various pre-processed time ranges are available, the simulation loads about 100k weather and 50k sea ice data per day. AMSR2 sea ice concentration data starts with 2016-01-01 and is provided by University Hamburg, Germany. A click on the map retrieves the latest five days forecast with a hourly resolution for chosen latitude/longitude pair. You may want to share the animated or single frame GIF. It takes a few seconds to render the animated GIF, please stay patient. It consumes a lot of CPU power and works best with Chrome on desktop. 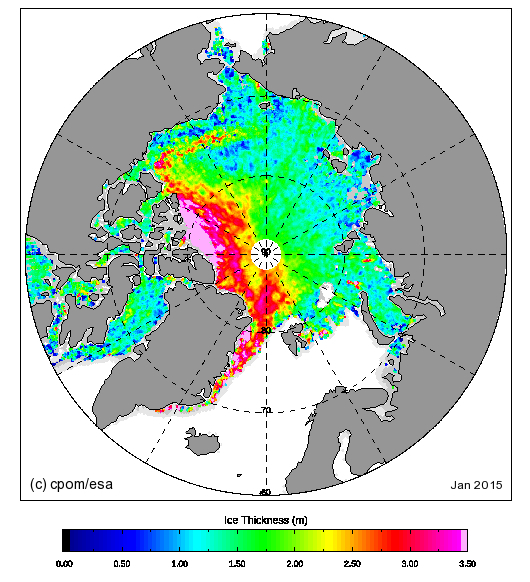 AMSR2 Sea Ice Extent based on grid cells with at least 15% coverage of sea ice. ASCAT Sea Ice Data The daily ice image products are generated from the ASCAT Level 1B sigma0 data which are operationally obtained from EUMETSAT. The images are produced using software that was developed as part of the NASA Scatterometer Climate Record Pathfinder Project. The coverage may vary due to delays in data availability or rev reprocessing. 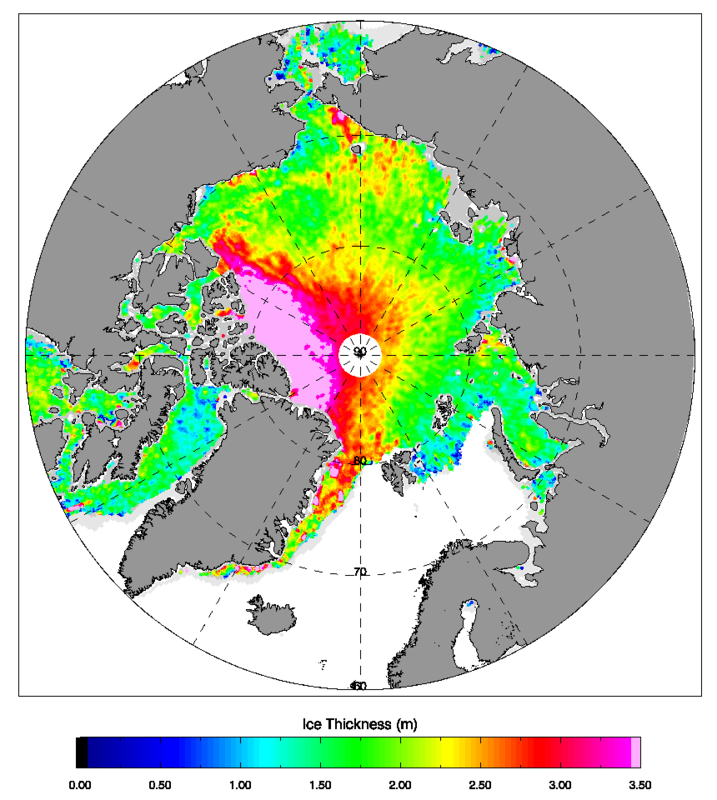 CryoSat 2 NRT Data CryoSat uses a synthetic aperture radar over areas of sea ice to measure a much smaller footprint than previous satellites. This provides the resolution to identify sea ice floe regions, and open ocean lead regions between floes, and to measure their surface elevations. Over sea ice, CryoSat echoes are assumed to scatter from the interface between the ice surface and the layer of overlying snow. During summer melting ponds irritate the radar and the service is suspended. Daily Satellite Images (MODIS) A true color image is generated each day for Terra and Aqua. A 721 bands false-color image is also generated for Terra. The image is composed of data collected during a single day (UTC time). Because Aqua and Terra are in a polar orbit, MODIS captures many images of Arctic throughout the day. To select the data used in the mosaic, the Rapid Response System chooses the data that are closest to the center of each swath, where edge distortion is minimized. This mosaicing technique creates the diagonal lines that give the image its "pie slice" appearance. NH Zonal Mean Temperature The NCEP GDAS and CPC temperature and height analyses are used to monitor processes in the Stratosphere and Troposphere. Temperature +80°North Daily mean temperatures for the Arctic area north of the 80th northern parallel, plotted with daily climate values calculated from the period 1958-2002. Modelled Ice Temperatures, most recent ocean forecast, produced by the DMI wave model WAM and 3D ocean models HBM and HYCOM. 850mb Temperature Anomaly Probability PSD Map Room Weather Products, provided by the NOAA/OAR/ESRL PSD, Boulder, Colorado, USA. Hi, thanks for your interest. I really appreciate your feedback. The easiest way to reach me is the contact form. Usually I come back to you within 24 hours, assuming a working email address was provided.